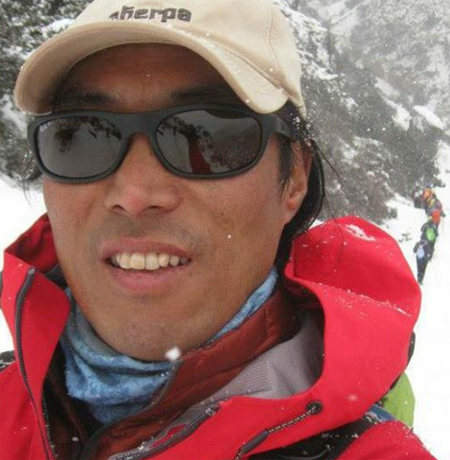 Serap Jangbu Sherpa, 46, was hanging on every bit of communication from the base camp in the Himalayas -by text, online, Facebook–when I called him on Saturday. It was like he was hanging on the side of the mountain he loved. Serap is a premier climber who has scaled Mt. Everest three times. But it’s tough to be a sherpa. Now he makes his living as a mountaineering consultant at a Manhattan sports store. When the news broke that a 7.8 earthquake hit Nepal, Serap, the president of the U.S. Nepal Climbing Association, knew what that would mean. There would be an avalanche resulting in injuries and lives lost, and maybe the loss of the climbing season itself. He was hoping it wouldn’t be like last April when an avalanche on the mountain killed 16 sherpa and ended the season. By mid-morning on Saturday, the sad numbers continued to mount as the quake cut sharply through Nepal and could be felt into neighboring areas to the east and west. Later, Nepalese officials confirmed to The New York Times that an avalanche slammed into a base camp, killing at least 10 climbers and injuring an untold number of others. Still, there was optimistic talk that the trekking could resume again. Hard to believe, considering the earthquake’s impact on the entire country. And yet, for Nepal, the Himalayan expeditions are the lifeblood of the country. It is their industry, where visitors can pay as much as $100,000 each to scale Everest, with the government getting a huge percentage of that. Nepal issues licenses for more than 1,000 trips a year. An earthquake at a key time in the climbing season only multiplies the devastation. I asked Serap Jangbu Sherpa if the expeditions could just pick up and start again in spite of the quake. “I don’t think it’s going to be closed,” he said, but he added it would “take a little while” to create the support systems for climbs to resume. Serap Sherpa said he lost a team member during one climb he made, and he recommended they return home. Still, that’s hard to see happening after last year’s tragic avalanche. In protest for better conditions, sherpas shut down the mountain until their compensation and working conditions improved. But now an earthquake has the entire country scaling a different kind of Everest just to care for the dead and provide aid to the massive numbers of injured. It’s hard to imagine the country back to normal when life is difficult everywhere you look. On Apr. 26, as of 3:30 pm ET, there have been 17 confirmed dead at Mt. Everest, and more than 2,500 confirmed dead in the the country of Nepal.